We obtained our own identity and our destiny would not be determined for us but determined by us. We remember that the Independence of Ceylon (as Sri Lanka was known) was obtained on February 4, 1948 from British Rule, by smooth transition after India gained its independence. Our patriots declared that we are a people created equal, free to think and worship as we feel. We were no longer colonists. We obtained our own identity and our destiny would not be determined for us but our destiny will be determined by us. We honour our patriots who contributed towards that endeavour. There shall be one law for all. The territorial law of Sri Lanka shall be the same for the entire country. The National Flag of Sri Lanka represents the country and her heritage as rallying device that integrates the minorities with the majority race. The Sri Lanka National Flag is an improvisation of the civil standard of the last king of Sri Lanka, Sri Wickrama Rajasingha. The civil standard had a passant royal lion with a sword in its right fore paw at the center, and a bo-leaf on each of the four corners on a plain border. When Sri Lanka gained her independence from Great Britain on February 4, 1948, it was the Lion Flag of the last king of Sri Lanka was hoisted once again. The first Prime Minister of independent Sri Lanka, D.S. Senanayake, appointed a committee to advise the government on the design of a new national flag. 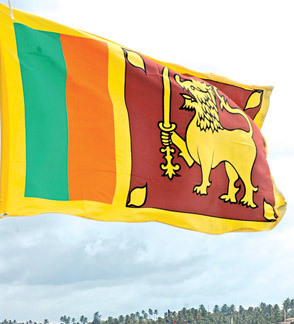 The lion in the flag represents the Sinhala race. The sword of the lion represents the sovereignty of the country. Curly hair on the lion's head indicates religious observance, wisdom and meditation. The beard denotes purity of words. The handle of the sword highlights the elements of water, fire, air and earth. The nose indicates intelligence. The two front paws purport to purity in handling wealth. The vertical stripe of orange represent the minority Tamil race and the green vertical stripe the minority Muslim race. The border round the flag, which is yellow in colour, represents other minor races. The bo-leaves at the four corners of the flag represent Buddhism and its influence on the nation. They also stand for the four virtues - Kindness, Friendliness, Happiness and Equanimity. The maroon coloured portion of the flag manifests the other minor religions. The national flag was hoisted for the first time on March 3, 1950. A National Anthem should be sung in its original version in the original language it was composed. All citizens should learn the meaning whatever race they belong. The national Anthem should be sung in Sri Lanka only in Sinhala. One national anthem, one nation. The third schedule contains only the words in Sinhala. As such the only valid and legal version of the National Anthem is the official Sinhala version. Sri Lanka's literacy rate is very high, all citizens can know the meaning of the national anthem and sing it within an hour. A national anthem is a patriotic musical composition that evokes and eulogizes the history and traditions of its people, recognised either by a nation's government as the official national song, or by convention through use by the people. Sri Lanka Matha is the national anthem of Sri Lanka. The words and music were written by Ananda Samarakoon in 1940 in the Sinhala language, and was officially adopted as the national anthem on November 22, 1951 by a committee headed by Sir Edwin Wijeyeratne. The demands of an outraged community have been met. We have achieved a victory for a safer world, for our democratic values, and for a stronger Sri Lanka. We fought and liberated the people held in hostage, what we achieved and what we have to do now to advance the peace and together with the people, forge a future of freedom, progress and harmony. Finally, we have averted the wider war this conflict might well have sparked. Now, we're entering a new phase - building that peace - and there are formidable challenges, the foremost amongst them is the democratic process, economic development and the Rule of Law. We must build and develop our country. For that to happen, the European Union must plan for tomorrow, not just today. Our friends the United States, China, India and the United Kingdom must assist us in our endeavour. They must provide most of the resources for this effort, but it is in Sri Lanka's interest to do our part as well. We must pave a path to a prosperous shared future, a unifying magnet more powerful than the pull of hatred and destruction that has threatened to tear us apart. Challenges. Sri Lanka still faces great challenges in this world, but we look forward to meeting them. Patriotism. Patriotism is the ground norm of Civilized Society. As citizens we owe allegiance to the Constitution of Sri Lanka. Civil allegiance is the duty of loyalty and obedience which a person owes to the State of which he is a citizen. Peace. We learnt that however much we strive for peace; we need a strong defence capability where a peaceful approach fails. Whatever the dangers of the action we take, the dangers of inaction are far greater. We must work as a community to ensure that everyone not just a privileged few get the collective ability to further the individual's interests. The governing idea of modern social democracy is community founded on the principles of social justice. That people should rise according to merit not birth; that the test of any decent society is not the contentment of the wealthy and strong, but the commitment to the poor and weak. But values aren't enough. The mantle of leadership comes at a price; the courage to learn and change; to show how values that stand for all ages can be applied in a way relevant to each age. We learnt that equality is about equal worth and not equal outcomes. We are a community of people, whose self interests and mutual interest at crucial points merge and that it is through a sense of justice that community is born and nurtured. This is the moment to bring the faiths closer together in understanding of our common values and heritage a source of unity and strength. By the strength of our common endeavour we achieve more together than we can alone. We must reach beyond our fears and our divisions to a new time of great and common purpose. Let us trace the roots of affirmative action. Let us determine what it is and what it isn't. Let us see where it has worked and where it hasn't and ask ourselves what we need to do now.